We can provide lessons to suit your needs. Whether you want private instruction on your own, or you have a small group of people, we can put together a custom-made lesson to suit you and your group. Get in touch with us and we can discuss what you have in mind or come up with a great plan that will be a lot of fun. At your favourite lake - Let me know where it works for YOU and have lessons right at your cabin or at a favourite place you love to paddle. Travel charges may apply. Harry Bailey Aquatic Centre - Great for practicing rescues in the pool no matter what the weather. Pool rental applies. Local urban ponds - Close at hand, warmer in the spring, and not too green until mid June or July. Great for short sessions. Pike Lake - Well-protected from the weather, a good swimming location, a few weeds epecially late in the season. This is my preferred location since it is close, has a good beach, and has weather protection. Blackstrap Lake - More exposed to weather, water quality is sometimes questionable especially once the motorboats churn it up, many motorboats. South Saskatchewan River - While I don't recommend this for a large class of first-time kayakers, the river can work OK for a small group or those that have been out on the water for a while already. The disadvantage is that the current moves us around and can make class control more challenging when people are just getting started. Mini-tour - Have your lesson as a kayak tour where we paddle from point A to point B, learning things along the way. Rates: Contact me for a custom quote. The standard rate is $200 for the first 2 hours, plus $100 per hour after that. A full day (8-hour) session is $600. I can take up to 6 people on the water at once, but you'll get more out of it with fewer people. If your group is larger than 6, people can take turns or I can bring in an additional instructor (additional charges will apply). 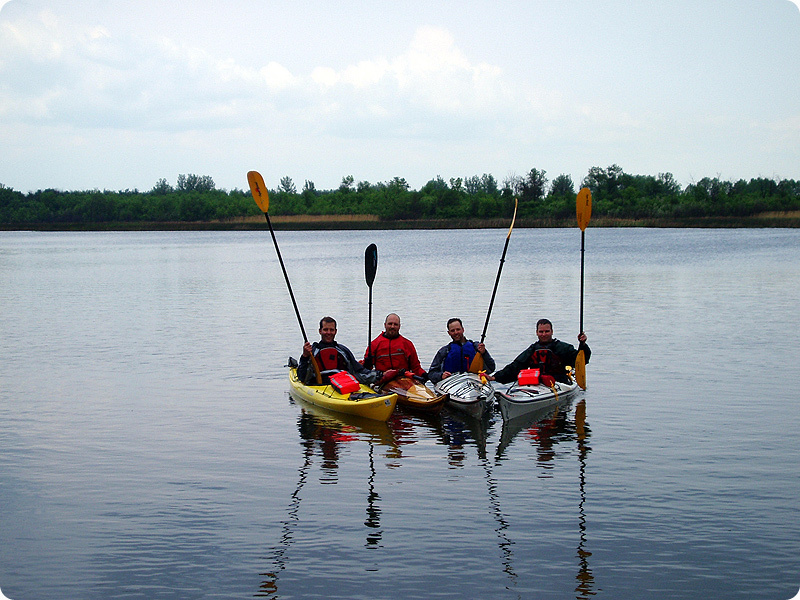 In 8 hours I can offer a full Paddle Canada-certified Introduction to Kayaking course for up to 6 people. All courses will be registered through Paddle Canada as a clinic or at the appropriate course level; this is included in the cost.